One of President Rodrigo Duterte’s pet peeves is seeing part of his audience go to the exit in the middle of his speech. Duterte thinks it worse if one of the VIPs on stage leave before he does. 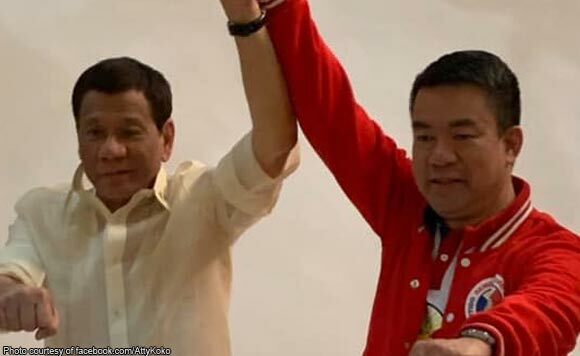 During a campaign rally in Bukidnon, Duterte was peeved that re-electionist Senator Koko Pimentel left without saying goodbye or before he could endorse the Cagayan de Oro native. Duterte made light of the slight and joke about Pimentel losing his slot in the administration’s senatorial slate. “You compare him with Koko Tolentino — Koko Pimentel. He already left. What plane did they use? Is it a cheap one? Because if that crashes, nah, we’ll lack one name in our list, and that’s because you’re going home ahead of everyone,” said Duterte.